Like some very grand ancestor of the 21st-century elephant pillow*, today's highlighted textile is a French tapestry from the Louvre. Woven with wool, silk, and metallic thread in Aubusson, it was possibly inspired by Persian miniatures and, according to the Museum, represented a rekindling of France's affinity for exotic themes in textile design in the 1840s. More on the creators here. *Just a few reminders of contemporary examples here, here, and here. Related past post: A Little Post-Holiday Splendour and Navigating the Maze. And the official results are in! 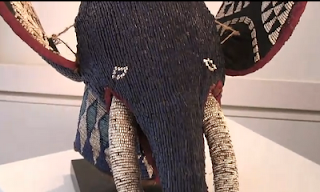 Participants at the High's Collectors' Evening 2011 voted to add to the Museum's permanent collection the 19th-century African elephant headdress mentioned here a few weeks ago. 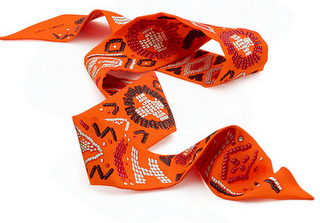 But five other new pieces wll be coming to the High, too. Click here for details. A quick note: I made the pillow comparison because elephant pillows have lately been a more widespread trend (and are made of cloth) but the tapestry certainly reminds many of us of Zuber's L'Hindoustan. Emile de Bruijn of Treasure Hunt just put together a wonderful L'Hindoustan post highlighting its connection to Basildon Park. 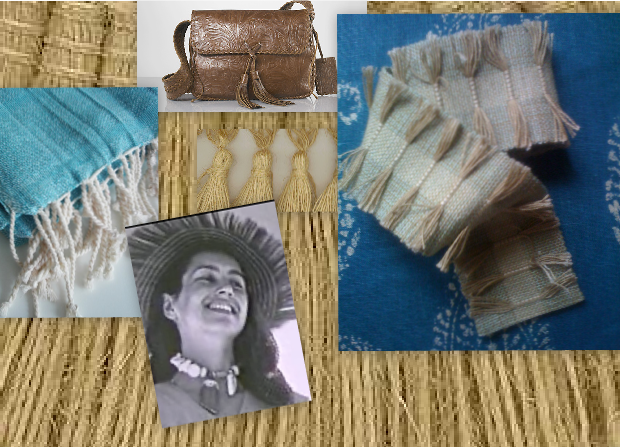 I'm supposed to be doing research for a possible post on fringe and frayed edges. But camels keep distracting me. First, it was a tiny creature spied behind the Moorish-style fretwork in the London home of the late Kenyan poet, Khadambi Asalache. 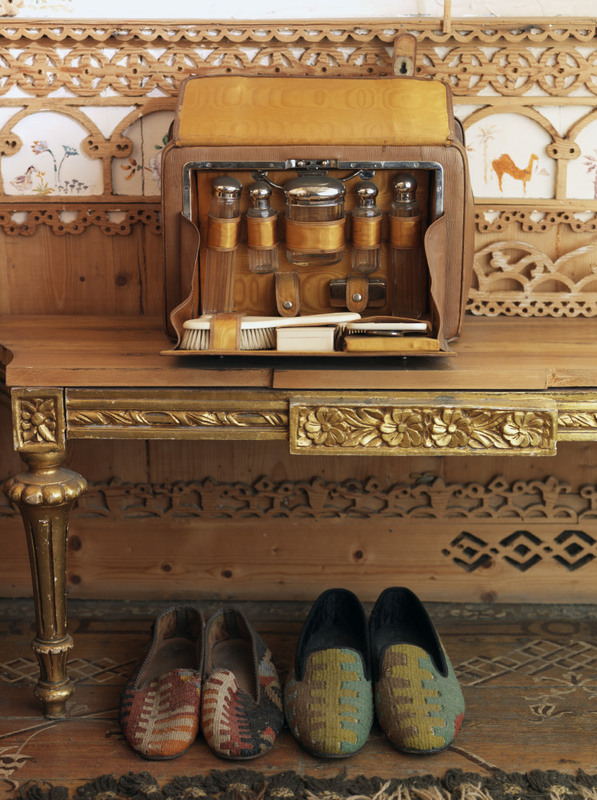 Emile de Bruijn of Treasure Hunt has written a must-read post about the modestly-scaled but magical house left by Asalache to the National Trust. Within his post is a link to another must-read: The Enduring Eloquence of True Beauty, a piece written by Emile for NT's ABC Bulletin (scroll down to page five). 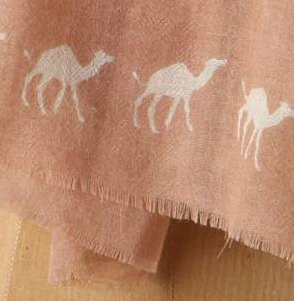 Other camel sightings include Anthro's gauzy Desert Crossing Scarf (with delicate fringed edge), this wood block for hand-printing textiles, and a camel regalia story in the latest Selvedge (issue 38). Just in: 9:35 p.m. Roni Jaco, owner of The Loaded Trunk, shares this photo snapped last year while traveling in India. This is the big week. 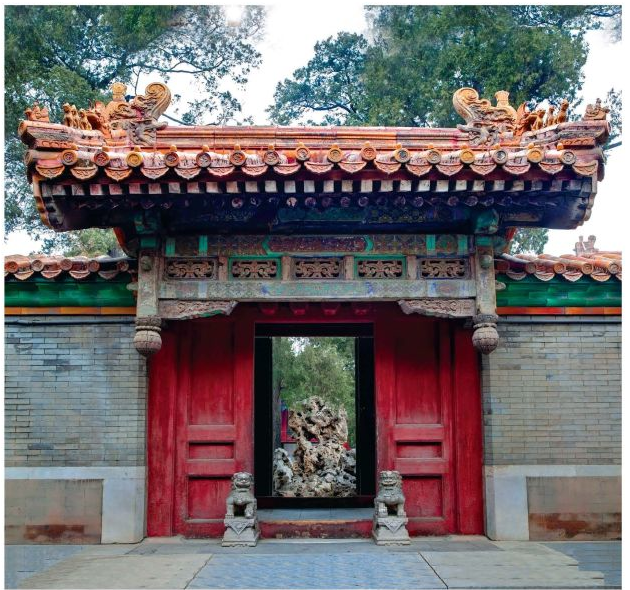 The Emperor's Private Paradise: Treasures from the Forbidden City, an exhibition that debuted last year at Peabody Essex Museum in Salem, Massachusetts, is opening at The Met on Tuesday. 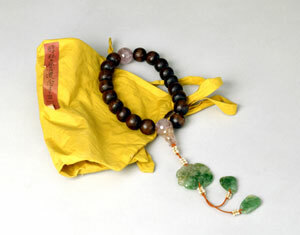 Some of you may remember that the show highlights ninety pieces from the private retreat of the Qianlong Emperor -- architectural elements, paintings, cloisonné objects, lacquer wares and other sumptuous decorative things that had essentially become dust catchers after the last emperor of China, Pu Yi, left the forbidden city in 1924. 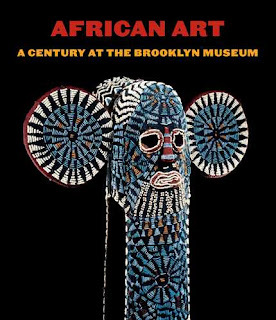 In conjunction with this major exhibition, next Sunday, February 6, the museum is offering an afternoon of free related lectures. Click here for details. Also of interest: Hold Everything (Qing Style). During the past few days, scores of artists have been bringing their work to Atlanta's Trinity School for the 30th Annual Spotlight on Art. As an enthusiastic collector of Birmingham-based Annie Butrus' smaller pieces, I was thrilled when I confirmed that, again this year, she is among the painters, sculptors, potters and photographers participating. Some of her gouaches from the Red and White series as well as other small works will be for sale at Spotlight's juried Artists Market January 31 - February 5, 2011. 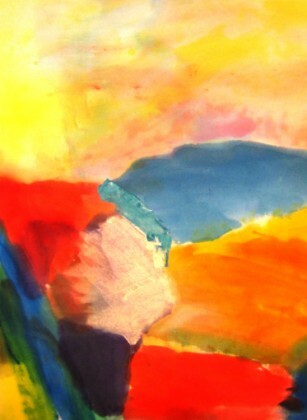 I think longtime readers are already familiar with Annie's abstracted studies of the Alabama landscape but if her name is new to you, be sure to explore her site or use the tags below to check out related past posts. The list of Spotlight alums includes so many distinguished names: Benny Andrews, Radcliffe Bailey, Thornton Dial, Gogo Ferguson, Robert Rauschenberg and Ed Moulthrop. This year more than 7,500 diverse pieces, encompassing original fine art, ceramics, and jewelry, will be on view with prices ranging from $5 to $5,000. 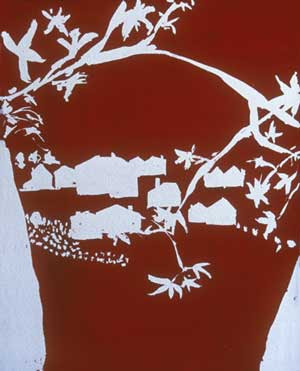 Other artists whose work I'm anxious to see at the 2011 happening include Lucinda Bunnen and Gregor Turk. Held annually at 4301 Northside Parkway, the Artists Market is open to the public with free admission and parking. 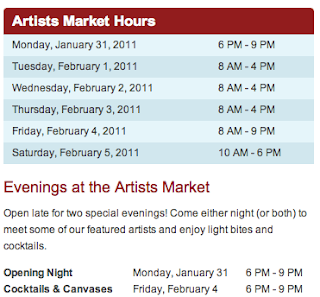 The atmosphere is welcoming and relaxed, so feel free to drop in anytime during the hours listed above. Related past post: Cafiero on Art. This morning I popped into the High Museum of Art for a quick preview of Toulouse-Lautrec and Friends: The Stein Collection, a striking exhibition opening Saturday, January 29. 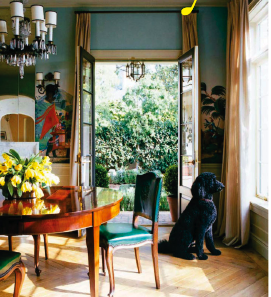 Howard and Irene Stein, another collecting couple, have been acquiring fin-de-siècle posters and prints since the 1970s and today posses a world-renowned collection of works by Henri de Toulouse-Lautrec. Happily for Atlanta and the High, the Steins are generous. Recently the couple gave the museum 47 works of art, encompassing pieces by Toulouse-Lautrec, Gauguin, Degas, Bonnard, and Daumier. And this is in addition to their past contributions. So, the new show celebrates the gift. As soon as the elevator doors opened, I was hit with a visual punch that quickly re-introduced me to Toulouse-Lautrec's brilliant use of color and simple line. Running concurrently with the Stein exhibition is Delacroix to Picasso: European Prints and Drawings from the High's Collection on view through May 1, 2011. Entering this show, I smiled when I looked up and saw one of Picasso's large drawings of Francoise Gilot. 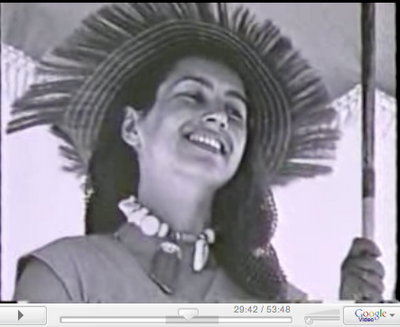 (In light of all my past Gilot-related posts, I had to mention it.) With Henri Cartier-Bresson: The Modern Century just around the corner (opens February 19), a great new season is unfolding at the High. 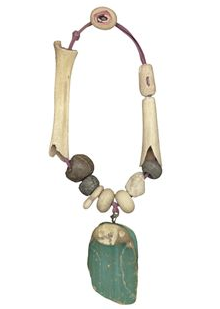 Related past posts: That Necklace Again and Fonts Instead of Faces. 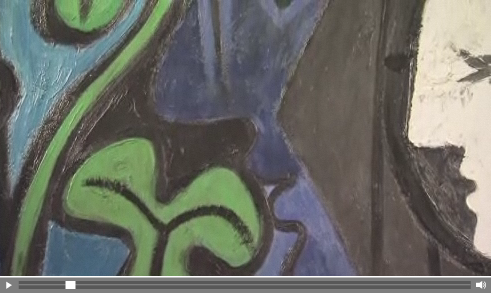 And a quick reminder: Picasso: Masterpieces from the Musée National Picasso, Paris opens at the Virginia Museum of Fine Arts February 19, 2011. Okay, I'm hooked on Connections, the Met's new weekly interactive feature launched earlier this month (see this past post for details). Today, museum educator Joeseph Loh references pieces in the Met's collection while sharing his thoughts on the ideal woman, and curator of prints Nadine Orenstein discusses the ideal man. Toward the end of his brief talk, Loh mentions his fondness for a specific type of Japanese painting, Tagasode (or Whose Sleeves). 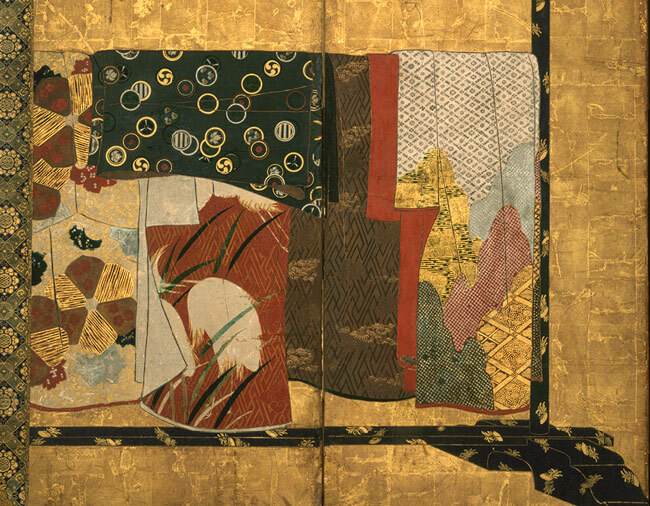 In these works layers of possessions -- here folded cotton and silk kimonos -- convey a portrait of someone but we never actually see a figure. The paintings are a bit like the Momoyama (1573–1615) and Edo (1615–1868) periods version of "What's in her handbag?". 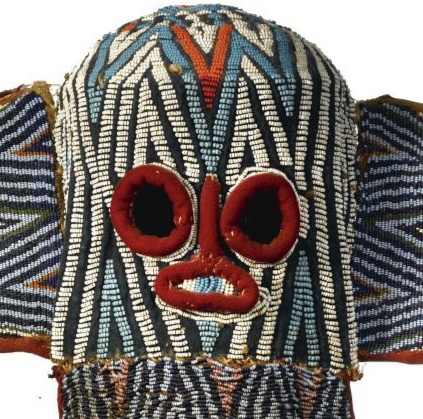 Or more precisely, to paraphrase the Met, the idea is that a picture of a person expressed through his or her personal belongings can be a stronger likeness than a conventional portrait. Click here to see the painted screen in full. It took me a few years to finally get around to ordering a woodblock and textile paint but once I had my hands on all the supplies the gratification was almost instant. 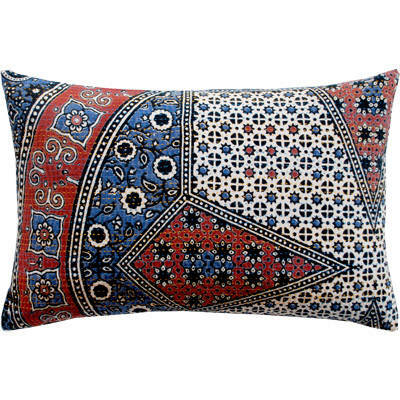 The pillow shown here (in the foreground next to Peter Dunham's Kashmir Paisley) was made with a section of natural linen block-printed by a middle school student. 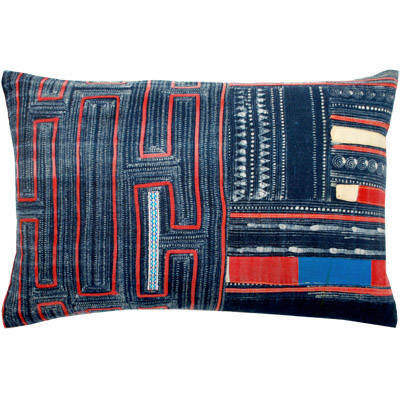 You know how some people add to the mix on their sofa a hand-stitched needlepoint pillow made by their grandmother or a friend? For me, this DIY pillow is in that spirit. Since the project began as an experiment, I started with the smallest size of the most economical paints from Dharma Trading -- navy, turquoise and white -- and then played around with mixes. Basically, we followed Elizabeth James' printing tips to the letter. If you're drawn to the idea of hand-printing some fabric for a pillow but think the imperfections inherent with lining up stripes will bother you, a block with one large free-form motif is a great choice. Just stamp away until you achieve an imprint you're satisfied with, being careful to leave an ample expanse of unstamped fabric surrounding what will become the "stamped medallion" of your pillow. For an array of animal stamps, click here. 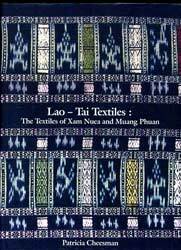 For sewing tutorials, visit The Long Thread. 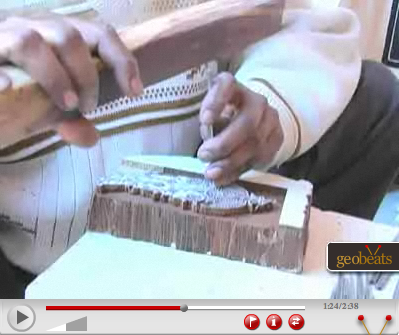 To see Geobeats' behind-the-scenes tour of The Anokhi Museum of Hand Printing, click here. 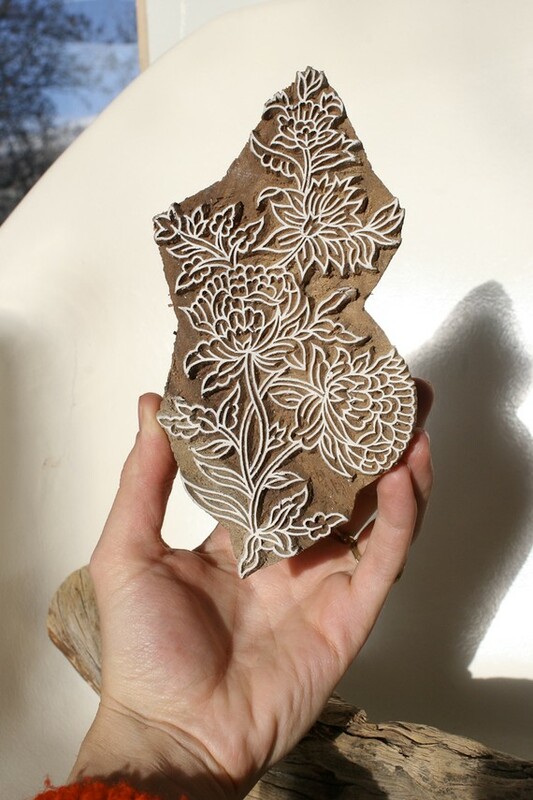 Also of interest, The Zucchi Collection, home to 56,000 antique and vintage printing blocks. Related past post: Upholstered Sawhorse Desk. 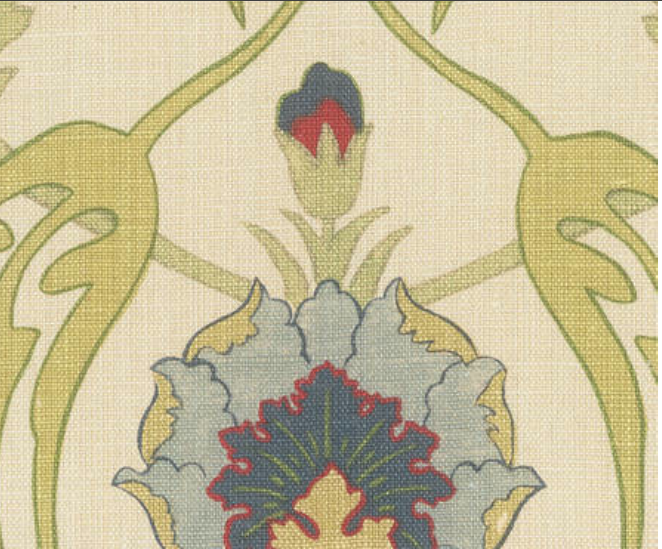 Yesterday's post was about the artist behind the textile, so I feel compelled to follow up with another Delaunay show sneak peek. 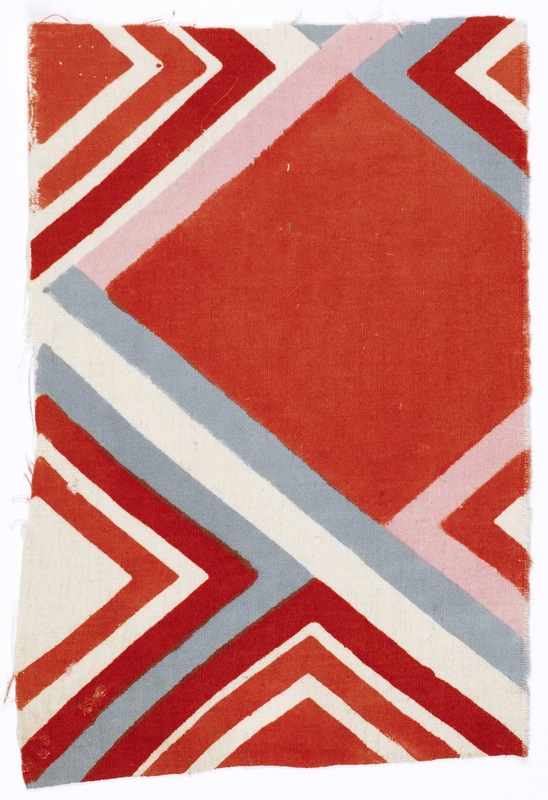 Color Moves: Art and Fashion by Sonia Delaunay, the first major U.S. exhibition of the abstract painter’s work in 30 years, is opening at the Cooper-Hewitt March 18, 2011. The vivid and rhythmic example of her 1920s work, above, grabbed my attention because it happens to be block-printed cotton. Also, work from this decade is a key focus of the show. One of the goals of the exhibition is to introduce U.S. audiences to the full scope of Delaunay's career with an emphasis on her lesser known designs for fashion and textiles. 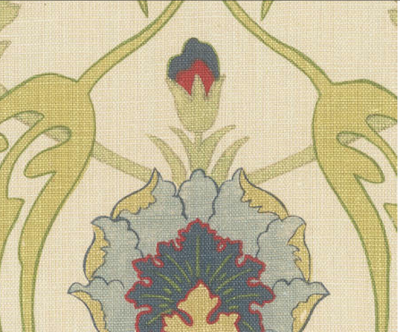 Two major periods will be explored: According to the Cooper-Hewitt, the first large gallery will highlight the 1920s, when she had her own Atelier Simultané in Paris, and the second section of the show will cover the 1930s, when Delaunay designed textiles for Metz & Co, a fashionable department store in Amsterdam. Toshiko Mori is designing the exhibition, which has been organized by Susan Brown, assistant curator, and Matilda McQuaid, deputy curatorial director. It should be an especially lively show for spring, but for those unable to view it in person, a catalog detailing more than 300 works -- paintings, textiles, bathing suits, coats and photographs gathered from institutions including Musée des Arts Decoratifs, Musée de la Mode de la Ville de Paris, and the Bibliotheque Nationale de France -- will be available. 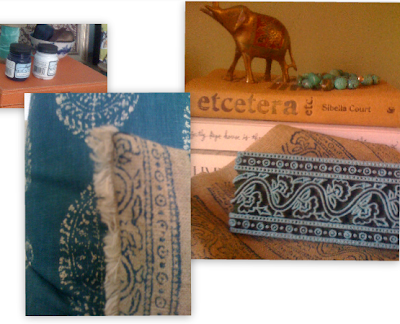 Over the weekend, I had fun with a creative young middle school student blockprinting on linen. (Final project to be posted later.) Mixing the messy inks and watching them react to various fabrics just heightened my appreciation for all patterns that show a sense of an artist's hand -- whether block printed or not. So, earlier today, I surfed over to the site of tattooed, Punk-meets-polish Brit decorative painter and designer, Adam Calkin. Calkin does wonderfully overblown, organic, historically-inspired patterns for Lewis & Wood. 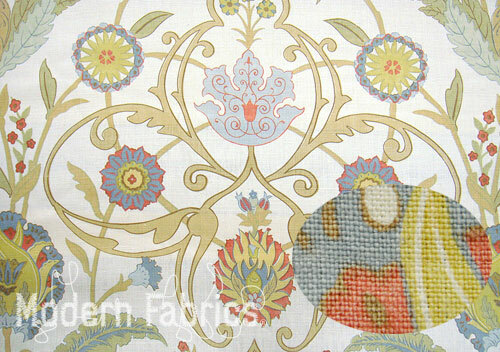 All of the patterns are gorgeous but his linen-jute blend, Ipek Damask, is a real favorite. 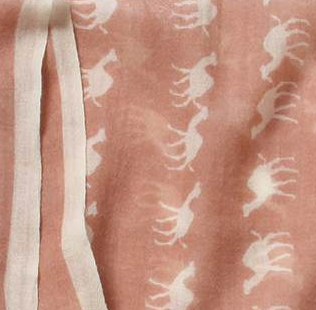 If you're a fan, too, it looks like Modern Fabrics -- the eco-conscious North Carolina-based company that salvages cutting room floor remnants -- recently rescued some yardage* (in the Fresco colorway) and is offering it to the public at a budget-friendly price. To view historic Ottoman textiles, visit the Topkapi Palace Museum and the website for the 2000 exhibition, Flowers of Silk and Gold: Four Centuries of Ottoman Embroidery. For background on Augustus Welby Northmore Pugin, the 19th-century architect cited as another influence on Calkin, click here. *At the time of this posting four yards were still available. 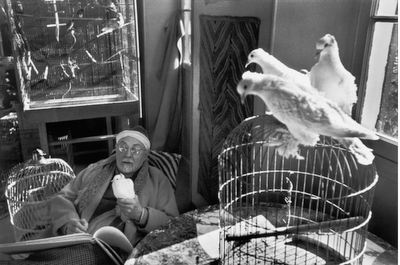 Thinking about collecting couples, like the Vogels, my mind wandered to Sidney and Frances Brody of L.A. 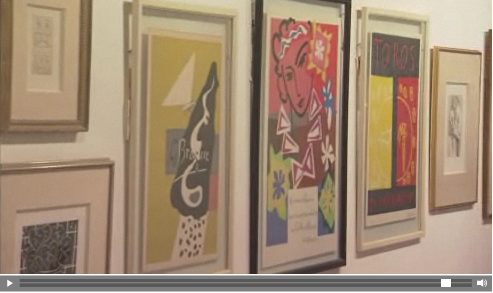 Different in terms of means and lifestyle, both couples enjoyed remarkable journeys as part of the 20th Century art scene. 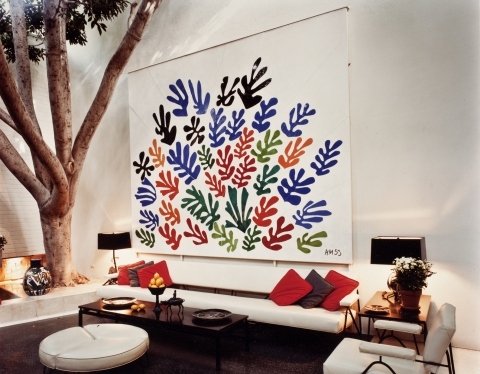 In case you missed this in 2010, LACMA's senior curator and department head of Modern Art, Stephanie Barron, wrote a great blog post about the late Mrs. Brody's gift to the Museum -- Matisse's monumental La Gerbe. Commissioned by the Brodys in the early 1950s for the large patio of their mid-century A. Quincy Jones-designed (and Billy Haines-decorated) house, the piece remained, according to Mrs. Brody, the heart of their home for more than 50 years. There's a wonderful transcript of Mrs. Brody's detailed recollections of the entire process -- conceptualizing the commission, visiting the octogenarian artist in France, communicating the vision, working out the incredible logistics of shipping and installing the precious ceramic pieces -- made available by LACMA here. For background on the Brody art collection, check out this Christie's video. Further details can be found here. I've been gathering supplies and inspiration for this weekend's block-printing project. 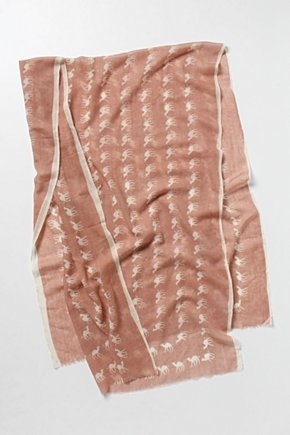 On the hunt for a little natural linen, I decided to give Hancock's a try before heading over to Lewis & Sheron. Some SCAD students were enthusiastically searching HF, too, looking for fabric to transform into something fab for their fashion design class (think Project Runway field trip), and that reminded me to post this link to deFINE ART-- a series of public lectures and exhibitions taking place in February at both the Savannah and Atlanta campuses. 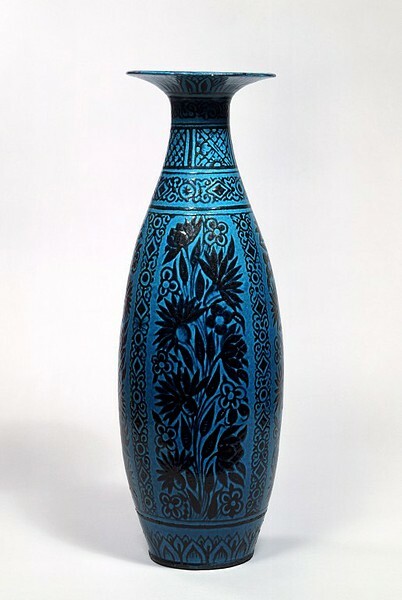 In India well over a century ago, an anonymous potter at the Bombay School of Art made the 19th-century earthenware vase with textile-like floral design, shown at top. Midway through a museum search for old Indian textiles, I came across it. Just too lovely not to share. 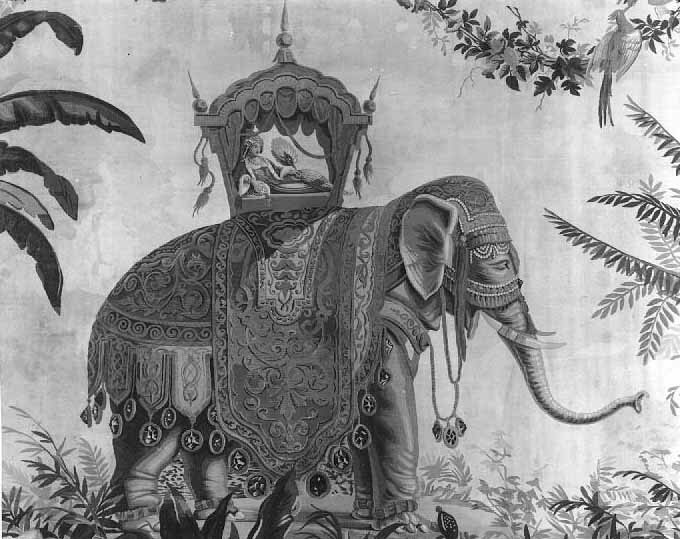 And speaking of India and aesthetics, another quick reminder: LACMA's 5th Annual Distinguished Lecture on South and Southeast Asian Art takes place tomorrow. 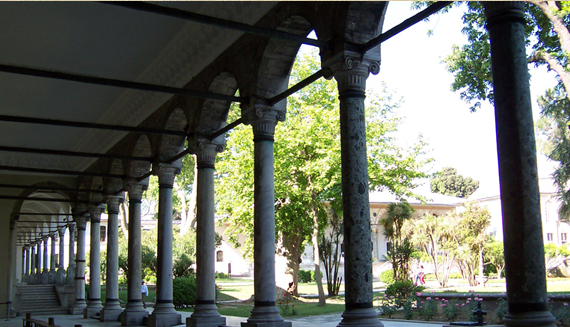 Scholar Rosie Llewellyn-Jones will present Europeans and European Influence in Nawabi, Lucknow 1775–1856, Saturday, January 22 at 3 p.m. Admission is free and reservations are not required. 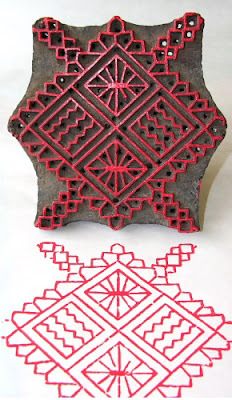 Links of interest: The Anokhi Museum of Hand Printing, and Flovers. In the art world, Herbert and Dorothy Vogel are a rare and inspiring pair. Working with more modest means than most collectors -- Dorothy is a retired librarian and Herb is a retired U.S. 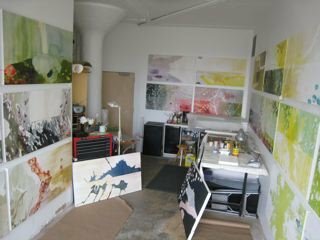 Postal worker -- but fueled by a shared passion for contemporary art, they have been acquiring pieces since their marriage in 1962. (Actually, they began before that; a ceramic Picasso vase was bought to celebrate their engagement.) Art was such a priority early on that the couple chose to live on Dorothy's salary from the Brooklyn Public Library, while Herb's income was saved for drawings and paintings. 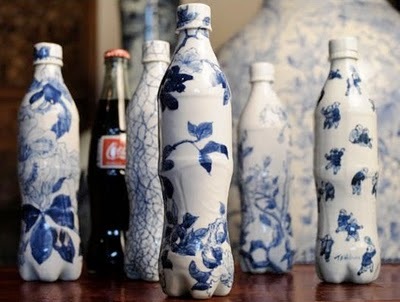 Along the way, they assembled an internationally respected collection that ultimately grew too big for their small New York apartment. 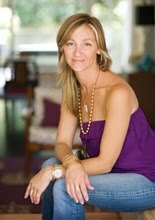 Related past posts: Delicious and Refreshing, Living with Art: Kristen Buckingham, Collecting and You Wanted Green, But Got Blue. These are the good kind of winter blues. 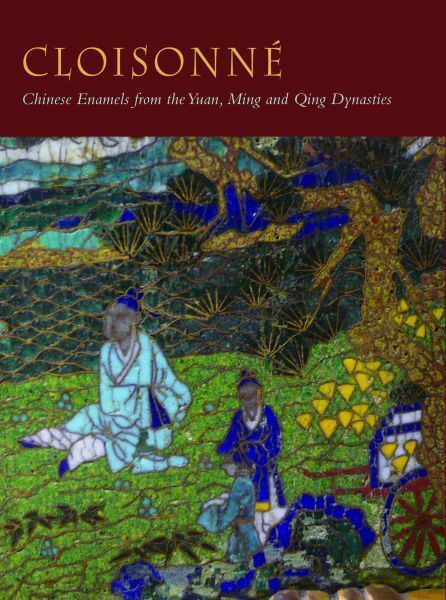 Back in December, I mentioned Atlanta-based designer Capella Kincheloe's affinity for 'Jingtai blue,' and posted a brief notice of the upcoming Bard Graduate Center exhibition, Cloisonné: Chinese Enamels from the Yuan, Ming, and Qing Dynasties. The show opens a week from today, January 26, so the exhibition page has been updated with more wonderful preview images. 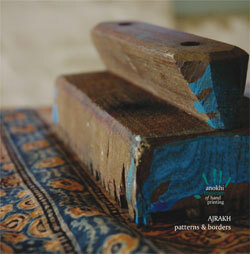 And the 368-page catalogue is now available for pre-order. Through Cloisonné, enamel pieces from Les Arts Décoratifs-musée des Arts décoratifs will be seen for the first time alongside objects from acclaimed U.S. public collections. 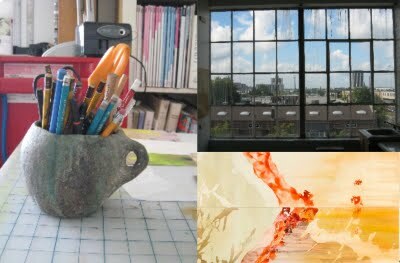 For example, the vase shown at top (a personal favorite) will be on loan from the Brooklyn Museum. Now, what's with my reference to the 80s? Today it's a stream of consciousness thing. 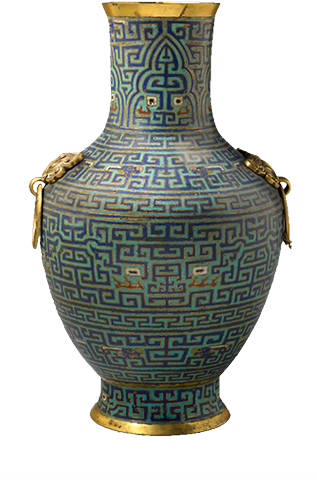 Cloisonné is characterized by very vivid juxtapositions of color (in fact, before perfecting cloisonné in the 15th century, the Chinese found the mix to be garish). These strong combinations make me think of Charleston-based interior designer Angie Hranowsky's use of saturated color. In a recent blog post she shared her approach to working with color -- specifically a 1980s-inspired palette. I don't expect to come across a bounty of peonies like this again until May -- or possibly in February for Valentine's. Yesterday, I felt lucky to find any flowers at all. But the snow didn't keep Anthropologie from shipping in armloads of beautiful blooms for the Westside opening. Seeing an abundance of peonies, ranunculus, flowering branches and leafy green plants when I made my first quick sweep through the new Atlanta location was invigorating. The natural-light-filled corner spot on Howell Mill Road is a terrific fit for Anthro -- urban yet literally still tied to the land. Apart from the fresh flowers and punchy nods to Vera Neumann, one of the displays that really caught my eye was a dramatic grouping of neutral African baskets high above the front entrance. (The Savannah Story creatures show off well here, too.) 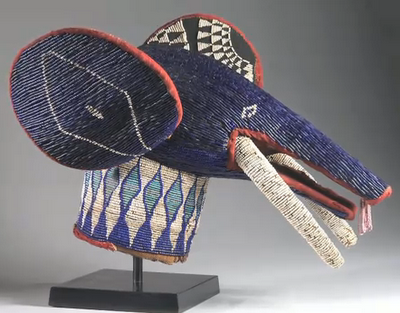 So, that put me in the mood to look for African baskets in various museum collections. Along the way, though, I found myself looking at the Brooklyn Museum's beaded, indigo-hued Kuosi Society Elephant Mask created by an unknown artist working in the Bamileke style. This elephant made the cover of African Art: A Century at the Brooklyn Museum -- not a small accomplishment considering the Museum's major collection of African pieces. There's a great Brooklyn Museum blog post about it here. Had it not been for this High video, I might not have paused to notice the use of blue in these beaded masks. Memphis Brooks Museum of Art also has a similar late-19th-century Elephant Society Mask. As mentioned last year, Memphis is home to some wonderful art patrons (like architect John J. Tackett). 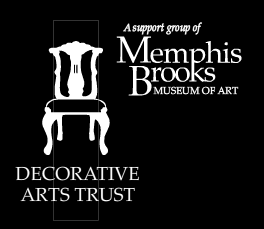 Click here to learn more about the Brooks' Decorative Arts Trust and the winter 2011 Master Classes. Related past post: Kelly en Perles. Last night I was able to catch just a little bit of American Masters' Jeff Bridges episode. On his lawn, Bridges has an expansive labyrinth and the filmmakers noted a key difference between a labyrinth and a maze: A maze involves alternate paths, so decisions are required to navigate it, but a labyrinth has only one route to center. The latter is less stressful. I'm sure the landscape architects and gardeners out there already know a great deal about this, but I'm only beginning to think much about mazes in design. Above is an abstract example spotted recently at John Robshaw's Souk. 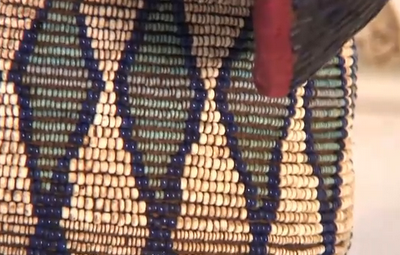 And a similar grid pattern can be seen in his spring 2011 Irrwadi collection. 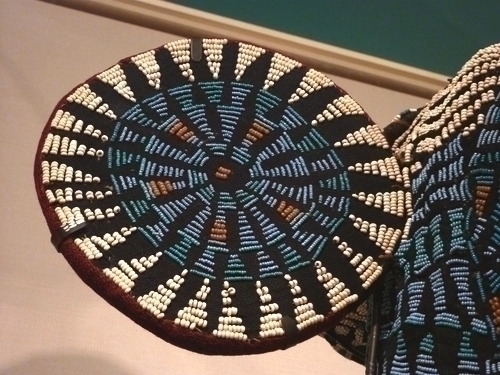 If you're drawn to the patterns mixed together in the pillow shown at the top, you might also enjoy Patricia Cheesman's Lao-Tai Textiles. The "labyrinth" scene in Orlando is among the most memorable but I'm not entirely clear on whether Tilda Swinton is running through a maze or a labyrinth. 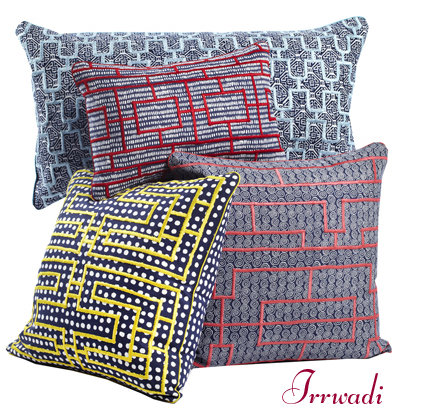 As fascinated as I am by the grid-like mazes, though, it's the more fluid Jogi Rali Patch that keeps calling my name.